You can buy any multiple of 5 copies of Trading Away Our Future for $38.85 for each 5 copies. This is a 40% discount. If you order 1 here, you will get 5 copies; if you order 2 here, you will get 10 copies. 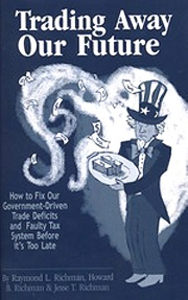 Trading Away Our Future: How to Fix Our Government-Driven Trade Deficits and Faulty Tax System Before it's Too Late by Raymond L. Richman, Howard B. Richman, & Jesse T. Richman, 229 pages, paperback, published by Ideal Taxes Association, 2008.